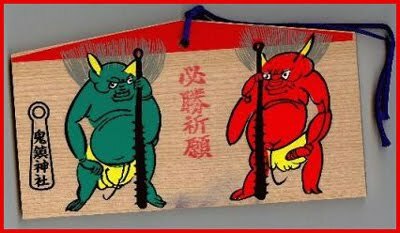 A Japanese ONI should not be compared to a Christian devil (akuma　悪魔).
. Yookai 妖怪 Monsters and Demons .
. Bakemono, O-Bake お化け Ghosts and Demons .
. kimon 鬼門を守る demon's gate .
. onifu 鬼符 amulet to subpress demons from China .
. Mayoke men - Demons to ward off evil .
. Mayoke amulets from 晴明神社 Seimei Jinja shrines - Abe no Seimei 阿倍晴明 .
. Namahage なまはげ demon figures .
. hamaki　破魔鬼　demon mask to ward off evil .
. Oni 登別の鬼　The Demons of Noboribetsu .
. Ushi-Oni 牛鬼 "bull-demon" . Oni jinja 鬼神社 "Demon Shrine"
In 1919, Fujishima Shima 藤島ツマ san started making them. She put an outline on the wooden tablet and then painted it with ink. 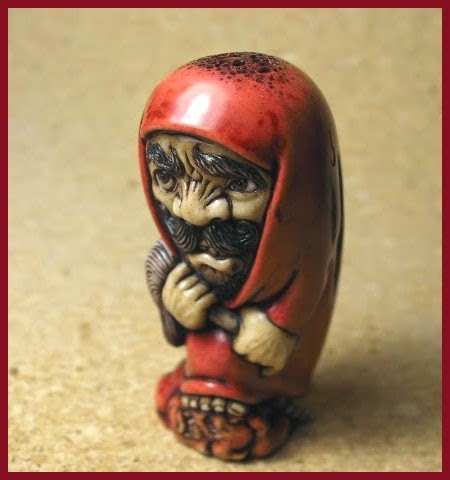 Many now hang in the shrine, they are said to help cure headaches and illnes of the head 「頭の病気」. 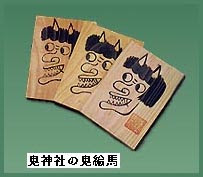 Hung at the entrance of your home, they ward off evil 「悪魔払い akumabarai, akuma barai - 悪魔退散 akuma taisan」. This "Demon Shrine" is located in the compound of the Tenman Shrine of Shirakihama. A square ema, only in black. 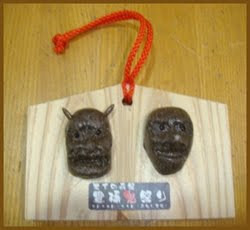 This is called an ema fuda 絵馬札 votive amulet, that you take home and pray to it every day. 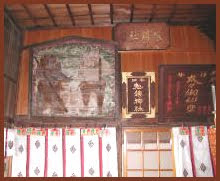 Homes near this shrine post this amulet at the entrance of the house to ward off evil and prevent fire. 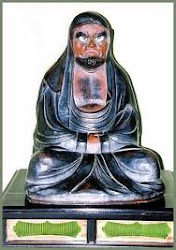 During the Kamakura period, the samurai Hatakeyama Shigetada 畠山重忠 had his castle Sugeya joo 菅谷城 nearby and the shrine was at the KIMON direction to protect the castle. He decided to make the oni his friends and invite them to help him win battles against his enemies. Casting out oni ogres might sound like something from the climax of a "J-Horror" film, but come February 3 every year, you'll hear the phrase said by nearly every homeowner in Japan. It's all part of the Setsubun ritual -- the annual tradition of purifying one's house and family in anticipation of the New Year. If you're a father, chances are you'll be pulling on a monstrous oni mask and getting pelted with soybeans from your kids. Then afterwards, the tradition holds that you should eat the number of dried soybeans equal to your age in order to protect yourself from illness throughout the year. Setsubun is celebrated in nearly identical ways across Japan, but there are a handful of shrines that venerate the oni devils themselves, such as the famous Kijin Jinja shrine in Saitama. 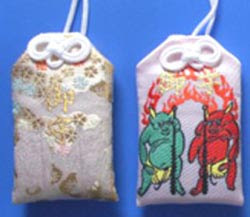 Here the oni are welcomed inside along with the good fortune. We can see what you're thinking: These shrines worship oni? Isn't that basically devil worship? Not exactly. The concept might sound off the wall in the context of a monotheistic, good-versus-evil sort of belief system. 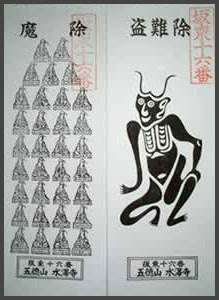 But Japan is a land of innumerable deities, and the oni, while often misrepresented as 'demons' in translation, are actually far more complex than their frightening countenances might suggest. The Kijin Jinja shrine has stood in Saitama prefecture for more than 800 years. The priests treat the oni as a god of triumph and victory. Samurai warriors prayed here before their battles. Now, in more peaceful times, students visit to pray for triumph over a different sort of adversary: their school entrance exams. 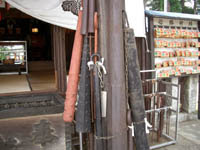 Those with serious prayers in need of fulfillment leave big iron clubs as offerings. This stems from the phrase "Oni ni kanabo" -- literally "an oni with an iron club," which is an idiom for "unbeatability" in Japanese. "In with good fortune! In with oni! And out with the devils!"
. 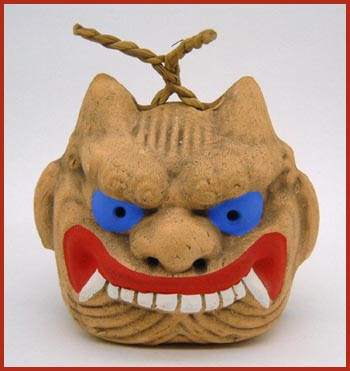 WKD : Setsubun Festival (February 3) 節分 . 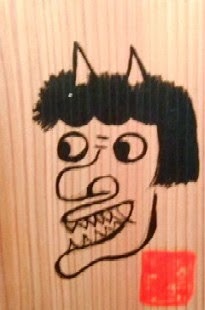 demon clay bell for Dainichi Nyorai . Oniyozu demon kite from Mishima island .
. . . CLICK here for EMA Photos !
. 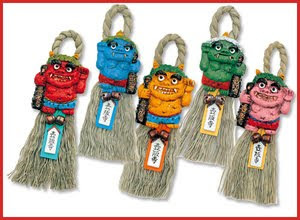 "Master Warding Off Evil" .
. toonanyoke Fudo 盗難除け不動 Fudo preventing theft and disaster .
. Yakuyoke 厄除け to ward off evil .
. Tomobiki day 友引 . On this day, - your own bad luck will affect your friends. In the West, avoid making important moves on a Friday 13th. The day is considered unlucky and decisions made on that day will have unfortunate consequences. For the Japanese, Friday 13th is just one of several unlucky days. The number 4 is unlucky because its pronunciation is the same as the word for "death". Therefore April 4th is unlucky (4th month, 4th day or 4-4). July 7th and August 8th (7-7 and 8-8) are considered lucky. 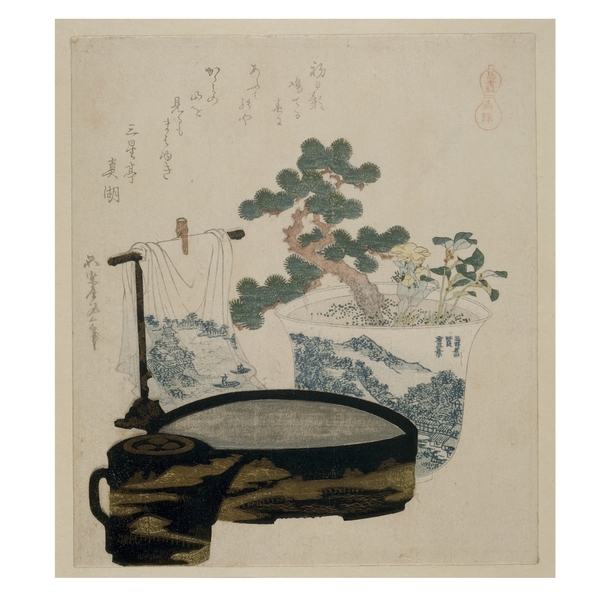 In fact for the Japanese, every single day is associated with luck, misfortune, or something in between. Delicate planning is required to make sure important occasions happen on the best day. This page explains 六曜 or Rokuyo, and the lucky and unlucky days of the Japanese Calendar. Their impact on weddings, hospital stays, funerals, baby booms and doing business in Japan is discussed.